In RadDiagram each RadDiagramItem can be resized. This operation is internally implemented by a ResizingService. In this tutorial we will examine a solution that allows the user to dynamically configure RadDiagramShapes resizing and decide whether to allow horizontal and vertical resizing. Next, we will add two RadToggleButtons to provide the user with the option to turn on and off the vertical and horizontal resizing of a shape. Now that we've defined the content of our view, we can start describing the custom resizing implementation. And as we need to disable a resizing operation based on dynamically set values, we will have to customize the default resizing mechanism. This mechanism is controlled by the ResizingService class which exposes a virtual method that calculates how to change the current size of a shape. Therefore we will start by creating a custom resizing service that derives from the RadDiagram ResizingService and we will override the CalculateNewDelta() method. Since we added two RadToggleButtons in our view, we need to define two boolean properties to track the checked state of these buttons and use them to control the result of the resizing operation. Please note that the CalculateNewDelta() method returns a result of type Point. However, this result doesn't describe coordinates of a point, but a delta value representing the change that should be applied on RadDiagramItem(s) size. This delta is calculated based on the resizing direction specified by the resizing thumb being used, the coordinates of the mouse when the resize was initiated, the coordinates of the mouse when the operation was finished and the rotation angle. The X porperty of the calculated result reflects the change in the Width of the manipulated item, while the Y property value reflects the change that has to be applied on the Height of the item. This is why when you override the CalculateNewDelta() method to return a Point with X and Y properties set to 0, you tell RadDiagram that there is no change in the size of the manipulated RadDiagramItem(s). If you take a look at the custom CalculateNewDelta() method implementation, you can note that the logic is straight-forward. It takes into account the values of the CanResizeWidth and CanResizeHeight properties to decide whether there should be a change in the Width or Height of the manipulated item. If both boolean properties are set to false, then the CalculateNewDelta() method returns a result of Point(0,0) which indicates that there are no changes in the size of the manipulated shape. This way the initiated resizing is ignored and the actual size of the manipulated shape is not changed. If you run the solution now the resizing buttons will be checked thus allowing all resizing operations. However, as soon as you uncheck any of the buttons, the related resizing operation will be denied. 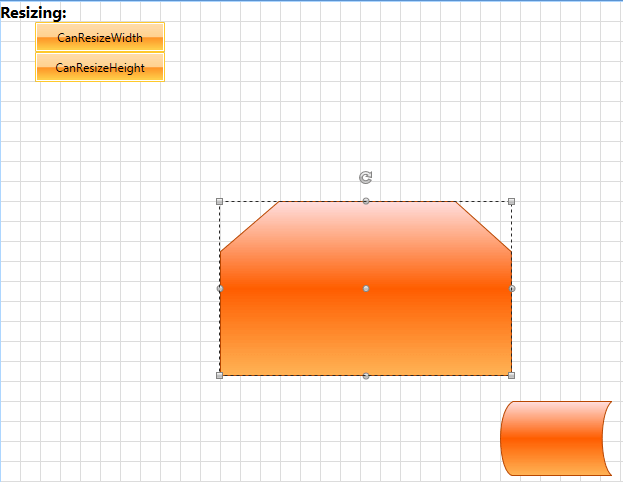 For instance, if you click the CanResizeWidth button, you will not be able to change the Width of the RadDiagramShapes. And as soon as you also uncheck the CanResizeHeight button, the Height will also be locked.